Stellar Four: Conspiracy Theory: Best In Show Is An Imposter! Conspiracy Theory: Best In Show Is An Imposter! Look, I'm not gonna lie. The great majority of my understanding of The Westminster Kennel Club's dog show stems from a Christopher Guest movie but I'm pretty sure they're only supposed to allow canines in the contest and there's no way in hell that this year's Best in Show winner is a dog. Nuhuh. No way. This little guy must be part of a viral marketing scheme for Disney's new Star Wars movies. Ladies and gents, meet Banana Joe. Do you recognize that sweet little face? Yeah, the last time you probably saw it was as an extra for Ewoks: The Battle for Endor. That's right, because Banana Joe is an Ewok. See? He's the guy in the middle. Obviously. And it's not even as if Lucasfilm's trying too hard to hide it. 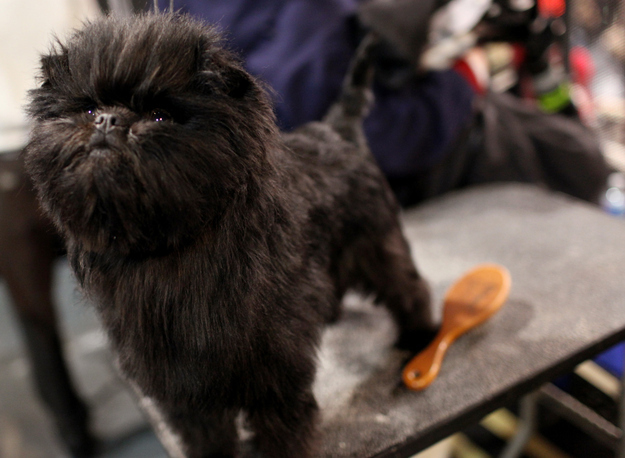 Banana Joe was entered into the contest as the totally made up "Affenpinscher" and now that he's won, he's retiring to "The Netherlands." Come on, guys. Really? Who's ever heard of a place called "The Netherlands." I call shenanigans. What do you think? I'm glad I'm not the only one who thought the winner looked like a four-legged Ewok.